Yes, there was cringing aplenty when I first opened the file. But almost immediately the miasma cleared as I found one fact that lit up the screen. The single most-requested “fresh and new” product among consumers across the board turns out to be… wait for it…. crochet patterns. WOWSERS! I nearly fell off my chair when I read that. I can’t remember if I squeeeed or not. The only witness to that moment was my fat white Chihuahua and he’s not talking. But I must have made some sort of noise. The findings of this report completely validate what my colleagues are all about and what has been my mission for nearly a decade, namely providing crocheters with new crochet designs. While it may be a remarkable statement to the needlearts industry as a whole, it’s a total way of life for us hard-core crocheters. The fact that there is a thirst for fresh crochet patterns isn’t startling news to everyone in the industry. I am most fortunate to be working with companies, in particular Tahki Stacy Charles and Caron International along with web-based NaturallyCaron.com, who have been and continue to be supportive, appreciative, even pro-active about answering the call for crochet design. This season, Tahki Stacy Charles unveiled two new patterns of mine, splashed across full-page ads in magazines and on their company website. On the left is September Morn, a fresh approach to traditional pineapple crochet, a genre that is dear to me. Done in Tahki Cotton Classic Lite, this little vest is sweet and so trend-right for fall. To the right is Song Sung Blue, long, lean and lacy. It is crocheted seamlessly in Tahki Dove, a luxury blend of extrafine merino wool and alpaca. It is my hope that this bit of information serves as an industry wake-up call, and not just for the selfish reason that I could always use another paycheck, but because the more crochet there is, the happier we be. There are wholesalers and retailers who have not yet begun to actively court crocheters, or simply don’t know what interests us or how to reach us. What you can do as a consumer to make your voice heard is to frequent shops, sites and events, talk and write about your craft, display your crochet on your body, and thus leave your mark of the hook everywhere you go. This entry was posted in events, published design by dorischancrochet. Bookmark the permalink. >I just found your blog and subscribed – love your patterns! I downloaded your "Lacy Duster" from favecrafts, and love it! I am in the process of making it right now, and think I finally mastered the Foundation Single Crochet stitch. LOL! I do have a question about the pattern – what are the abbreviations "RS" and "WS" (in the yoke section" for? I can't figure that out! Thanks! >Your words have come not a moment too soon! While I like to knit, I LOVE to crochet. 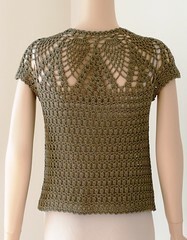 I've never understood the relative lack of stylish/trendy crochet patterns. Hopefully, with your "pull", the yarn industry will listen! >I bought both of these patterns, Doris. They are, as usual, gorgeous. I can hardly wait to start! If I sent a photo to you of an angel tree topper do you think you might recognize it? The pattern is lost and I am frustrated. In the early-mid 80’s (83-86) I crocheted two of a pattern for a tree topper angel that is primarily in the pineapple pattern. Her defining features are 1. yarn hair wound around a knitting needle and baked to curl it 2. Gold seed beads crocheted into the pattern throughout the dress, wings, and halo 3. facial features embroidered on 4. crochet-covered pipe cleaner arms.